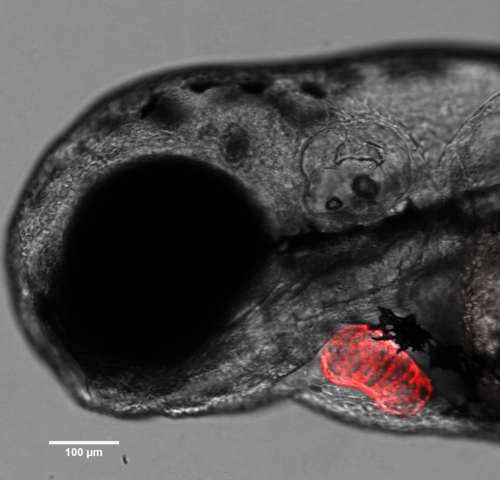 Zebrafish hearts can regenerate: what are the cells talking about? Dr Beck Richardson has won a studentship from the British Heart Foundation to fund Aaron Scott to do his PhD exploring how zebrafish are able to regenerate their heart tissue. Zebrafish are a fascinating species that are able to regrow tissues such as their heart, central nervous system, retina as well as many others extremely efficiently. Aaron Scott will be studying a zebrafish model of cardiac injury, where the heart later regenerates, to better understand the mysteries surrounding this phenomenon. Aaron’s project will focus on release of extracellular vesicles, tiny lipid membrane wrapped packages sizing from 30-1000nM that cells send to one another as a way of communicating. Previously, increased numbers of extracellular vesicles have been shown as potential biomarkers of cardiac disease though little is known about their contents or function in this context. Aaron’s previous work, during his MRes in Dr Beck Richardson’s lab in the School of Physiology Pharmacology and Neurosciences, developed a novel methodology to study the cellular origin and track the movement of extracellular vesicles using translucent zebrafish larvae. The lab can genetically engineer certain cell types within the fish to incorporate fluorescent markers in their lipid membranes which are then incorporated into the extracellular vesicles that cell produces. Using this method, it is possible to ascertain the cellular origin of these vesicles and to visualise their location in the blood and pericardial space of zebrafish, and also to extract the vesicles for deeper analysis. Aaron’s PhD will follow on from establishing this methodology by applying it to models of heart injury in adult fish, similar to what you would see after a heart attack. The aims are to explore if vesicle numbers increase and if the factors they carry change, for example by looking for changes in the transport of regenerative factors which may influence certain cell types during heart repair e.g. growth of new blood vessels or changes to the immune system. Information gained from this research will be very insightful as to how zebrafish regenerate and may influence future therapies for patients suffering from cardiac disease. "I am incredibly happy that we have been awarded funding for this PhD studentship. It allows us to carry on the exciting work we began during my Master of Research project, using the zebrafish as a model system to dissect cardiovascular cell-cell communication during heart regeneration! It is a priviledge to be funded by the British Heart Foundation and I am proud to be a University of Bristol student." This project utilises the world class laboratory facilities in the Faculty of Biomedical Sciences including the new Lightsheet microscope recently added to Wolfson Bioimaging Facility and the Flow Cytometry Facility.